I tested all the ports while connected to a Tab S4 and they all work including plugging in an ethernet adapter. This hub does not give the error "Close cover to run DeX" so the Tab S4 tablet does not need a keyboard or book cover to operate with this hub. I have two ethernet adapters, both work when directly plugged into the S4 however only the 10/100 adapter works when plugged into the hub, the 1000g adapter lights up but does not work. I assume that the faster adapter requires more power than the Samsung adapter can provide. Is there a Samsung certified power adapter with more capacity than the one that comes with the Tab? You can use any 5 Volt power source, as long as you have a cable with the right connector. (In the shop we used a 30 Amp, 5 Volt supply with about a dozen power cords coming off it.) It doesn't have to be Samsung certified, only a well-regulated 5 Volts. Go for as much current (Amps) as you can find. Amazon, Best Buy, Newegg - they're all loaded with them. If you want fast-charging, it will have to be a PD or QC 3,0 or 4.0 supply. And with 3 USB ports, the maximum current the port can possibly draw is 6 Amps (2 Amps per port). I doubt that the Ethernet adapter is USB-powered and designed to draw more than 2 Amps. If it is, I wouldn't trust it - the design would exceed the port specs. I did some further testing using my Moto charger which is 3.0a at 5v plus 9v and 12v and the faster adapter will not work in the hub so I'm guessing that it's just an incompatibility with the hub. No biggie as I'll probably use wireless anyway. Odd that my Moto Z3 adapter has a higher current output then either my Galaxy Book or S4 Samsung adapters. Ordered this Ethernet adapter and it works great with the above hub. I just received this stand for $10 on Amazon, great quality stand and much better than I expected. I decided to put the tablet on a stand for three reasons. 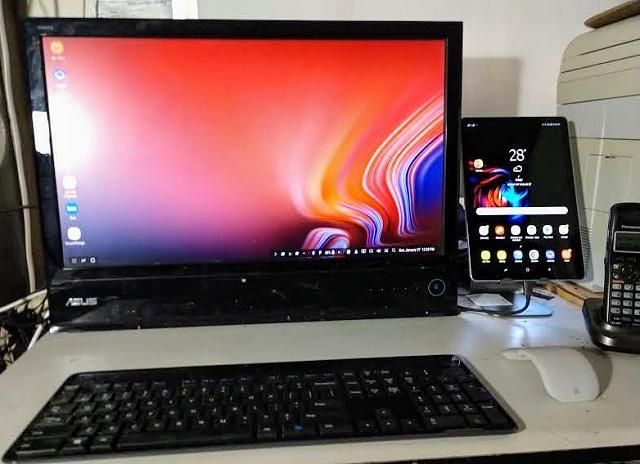 First, it takes up less space this way, second, it allowed for a stree-free USB connection, and lastly, because I have DeX set up to extend my mouse off the right side of my monitor onto the left side of the tablet so I can use my mouse on the tablet as well. I'm using a Logitech keyboard that I had, it's the 2.4ghz kind and the receiver is plugged into the hub. The mouse is a Microsoft Surface Arc mouse that I bought for use with my Galaxy Bool. And listed in the above posts are the Aplomb hub and Anker USB Ethernet. The tablet is a Galaxy Tab S4. Can you simply mirror your screen to watch Netflix on the big screen? Yes, it's as simple as swiping down and selecting the shortcut for Screen Mirror to cast to your smart TV or a USB-C to HDMI cable to connect to your monitor. If you want to charge at the same time you will need some kind of hub as well. USB Data Transfer not working. Faulty Mini-USB port. How to take full backup? Back arrow on S9+ not working.